Thumbay Hospital, Dubai was dressed in pink at the launch of its Breast Cancer Awareness Campaign in association with RTA’s Dubai Taxi Corporation (DTC), featuring a unique ‘Pink Ribbon Formation’ by pink taxis of Dubai Taxi Corporation on Monday, 11th Jan. 2016. A total of 35 pink taxis participated in the pink ribbon formation, which was intended to raise awareness of breast cancer and to stress the importance of early detection as the best way to prevent the disease. The campaign highlighted the importance of regular breast screenings as the easiest way for early detection. His Excellency Shaikh Mohammed Maktoum Juma Almaktoum, Chairman – MBM Groups, Dubai was the Chief Guest of the event, titled ‘Pink Drive’. He formally inaugurated the campaign in the presence of Mr. Thumbay Moideen, Founder President – Thumbay Group, Dr. Yousif Al Ali, CEO – Dubai Taxi Corporation, Prof. Gita Ashok Raj – Provost of Gulf Medical University, Mr. Akbar Moideen Thumbay – Vice President of the Healthcare Division of Thumbay Group as well as members of the administrative teams of Thumbay Group and DTC. “Through this campaign, we aim to encourage all ladies to undergo frequent screenings to safeguard themselves against breast cancer. The disease is very treatable these days as long as it’s found early and treatment is initiated,” said Mr. Akbar Moideen Thumbay. 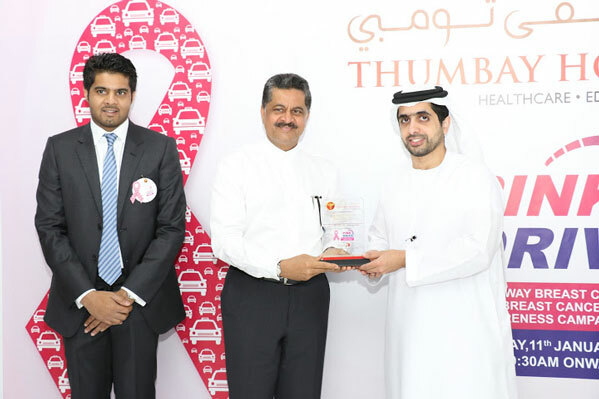 Dr. Yousif Al Ali said that Dubai Taxi Corporation was proud to be associated with organizing the unique campaign spreading the positive message of breast cancer awareness. “We hope that the campaign would lead to more women being educated on the issue of breast cancer, eventually saving lives,” he said. The program also had a seminar on breast cancer awareness, organized by HEALTH magazine, the premier health and lifestyle publication owned by Thumbay Group. The seminar had a special session where four breast cancer survivors from Dubai narrated the real-life stories of their trysts with the disease and how they overcame it. The seminar also had a session with Gynecologist Dr. Sireesha Edamadaka from Thumbay Hospital, wherein she outlined the characteristics of breast cancer, the ways to detect it and the preventive measures. A number of women participated in the campaign and learned about breast cancer, its deadly nature and the importance of early detection for protection. They were also educated about conducting self-examinations as well as about when to start getting mammograms. Each Pink Taxi Lady Driver who participated as Pink Campaign Ambassadors were gifted Thumbay Hospital vouchers that entitle them to free benefits such as gynecologist consultation, mammogram, blood sugar, blood pressure and BMI checks and dental consultation, as well as discounts on select dental treatments. They were also awarded gift baskets. The breast cancer survivors who participated in the seminar were also honoured at the function.